President Trump says he's creating a $1 trillion plan to rebuild America's roads, bridges and runways. "We will create the first class infrastructure our country and our people deserve," Trump said this week in Cincinnati. "It's time to rebuild our country to bring back our jobs." On Friday he is scheduled to appear at an infrastructure roundtable at the Department of Transportation. Over 10 years, Trump's budget allocates $200 billion of federal money for infrastructure spending. But it also cuts $255 billion in existing infrastructure programs that it calls wasteful, including grants for highway renovation, Native American water facilities and rural airports. 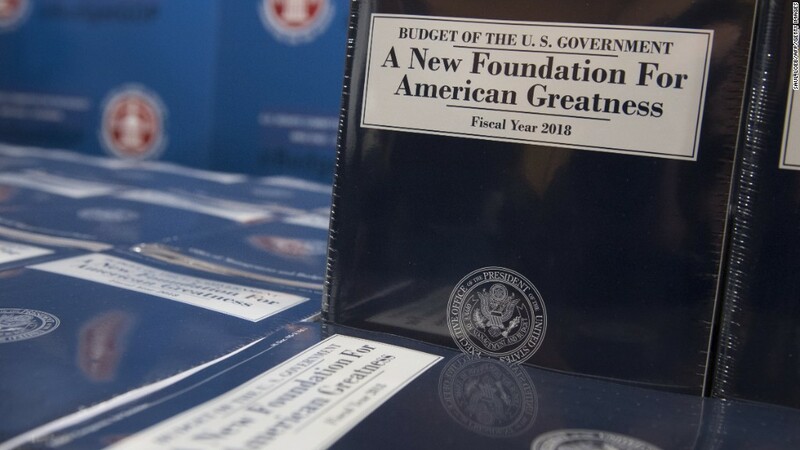 The White House's Office of Management and Budget contests the UPenn tally of the budget. It says the cuts proposed for one year can't be assumed to be the same for 10 years. Kimberly Burham, managing director at the Penn Wharton Budget Model, says such assumptions are reasonable and common when conducting a budget analysis, even if they aren't ideal. The White House OMB says some cuts are for programs in which not all the funds go to infrastructure. It further adds that major cuts in UPenn's tally aren't considered cuts by the administration but are programs it won't be renewing once they run out of their current funds. But Trump isn't convincing many that his infrastructure plan will become law anytime soon. The Office of Economic Cooperation and Development cut its forecast for U.S. growth on Wednesday, citing the slow pace of Trump's economic reforms. Economists surveyed by CNNMoney also don't believe a detailed bill, let alone a passed one, is coming from the White House this year, though they are hopeful for 2018. "It is looking less and less likely that any major deals are going to get done this year," says Sam Bullard, senior economist at Wells Fargo. Infrastructure spending is a proven winner for the economy: It creates jobs, fuels growth and allows Americans to get from point A to B faster, making them more productive. All sides agree the United States needs a major upgrade of infrastructure to update congested and crumbling highways, overworked subways and also to build new tunnels and bridges. But experts say Trump's budget doesn't reflect a commitment to his own infrastructure plan. Since it's only funding $200 billion of the $1 trillion plan, it's aiming to have private businesses foot the other $800 billion. The Trump administration argues that private investment lowers costs for federal taxpayers. Critics of the plan say private companies that build new roads, bridges and runways will just send the bill to taxpayers or drivers paying tolls. In short, it would hit the wallets of ordinary Americans. "The private sector is not going to build our roads and bridges for free, they expect something in return," says Hunter Blair, a budget analyst a the Economic Policy Institute, a left-leaning research group. Trump's team plans to change regulations to make it more attractive for companies to invest in public construction projects, but it hasn't said exactly how it will change the rules. That lack of clarity leaves some scratching their heads as to how businesses will foot 80% of Trump's infrastructure plan. "There's a lot riding on changing regulations," says Burham of UPenn. "It's hard to assess how successful the regulatory reforms will be to encourage private investment." The administration's budget proposes spending cuts for Amtrak, federal grants for highway renovation and transit projects. It argues those programs were wasteful spending. There could be some truth to that. For instance, the government's TIGER grants for highway projects received several repeat applicants last year, meaning they didn't finish the project with the original funds they got. The only thing Trump, critics and the public appear to agree on is that a big fix is long overdue. But the path to get there is unclear.